The static address configuration of networks and hosts allows attackers to have enough time to discover target networks and systems. On the other hands, the defenders always lack of time to respond because they can take action after attacker’s explicit behaviors. 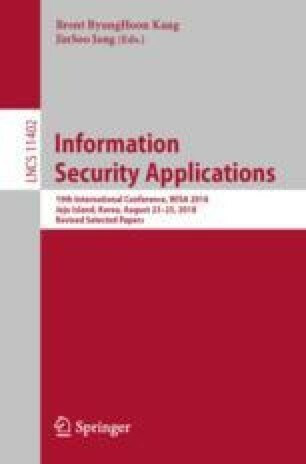 To eliminate the attacker’s asymmetric advantage of time, randomization of addresses have been suggested as Moving Target Defense (MTD) which is a promising technique to make the attacker’s reconnaissance activities difficult by dynamically changing network properties. In this paper, I propose the address mutation scheme using vector projection for tactical wireless networks that are a leader node centric hierarchical structure. In the proposed scheme, the addresses in the same networks are mutated with a simple vector operation by fully distributed manner and the mutated addresses are shared to all the members in the internal networks. Unlike the conventional schemes, all addresses associated with network entities for data delivery are mutated. I evaluate the performance of the proposed scheme by numerical analysis and experimental simulations. The results show that the proposed scheme could effectively randomize the addresses in tactical wireless networks.